What does it really mean to be a “learning organization”? What does it take to get the people in a nonmanufacturing environment to think of work in terms of flow? How do you build a culture based on lean principles and lead that culture as it continuously evolves? 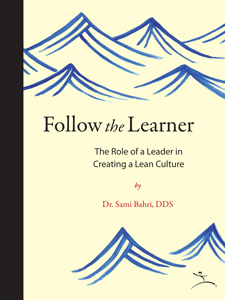 In his book, Follow the Learner: The Role of a Leader in Creating a Lean Culture, Dr. Sami Bahri describes how he and the staff in his dental practice tackled each of these questions. The book describes how their organization, the Bahri Dental Group, transformed their work and their thinking from a traditional batch-and-queue approach to one focused directly on the needs of the patient, not on the needs of the practitioners.